Brave (film) An animated feature from Pixar. Released in 3D on June 22, 2012. 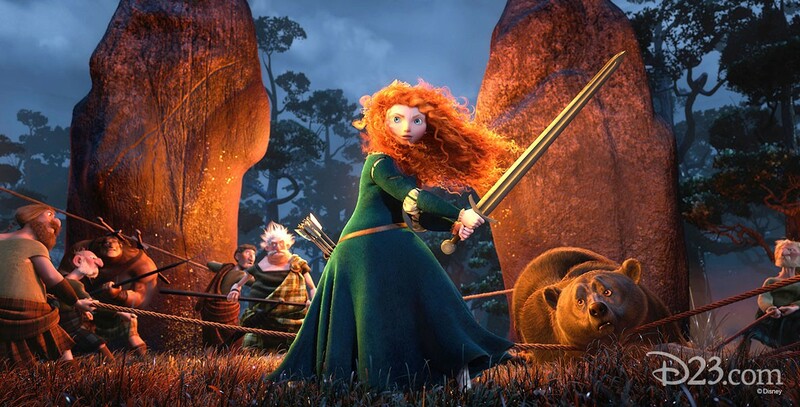 In rugged and mythic Scotland, the impetuous, tangle-haired redhead Merida, though a daughter of royalty, would prefer to make her mark as a great archer. A clash of wills with her mother who tries to arrange a marriage for her daughter compels Merida to bolt off into the forest on her faithful horse. Merida is led by the will-o’-the-wisp to an enchanted place, where she makes a reckless choice, unleashing unintended peril on her father’s kingdom and her mother’s life. She has to struggle with the unpredictable forces of nature, magic, and a dark, ancient curse, to set things right. Directed by Mark Andrews and Brenda Chapman. Voices include Kelly Macdonald (Princess Merida), Julie Walters (Witch), Billy Connolly (King Fergus), Emma Thompson (Queen Elinor), Kevin McKidd (Lord MacGuffin), Craig Ferguson (Lord MacIntosh), Robbie Coltrane (Lord Dingwall). 94 min. Working title was The Bear and the Bow. Filmed in Cinemascope. Brave won the Academy Award for Animated Feature.